ASC 606 is coming fast. 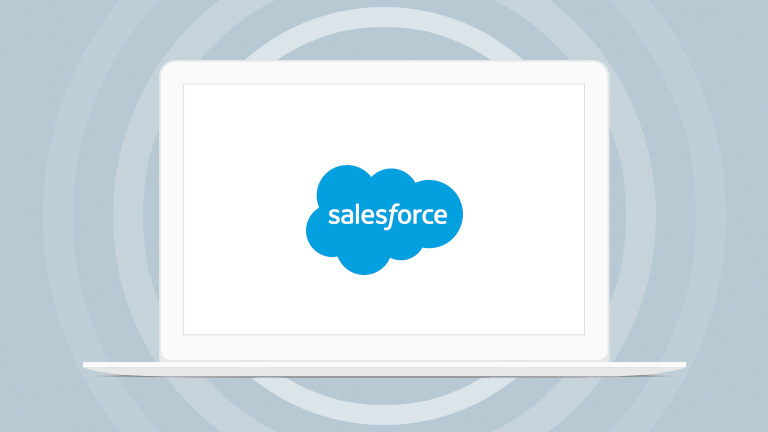 Get up to speed with Meredith Schmidt, Salesforce's EVP of global revenue operations. ASC 606 is a new accounting standard for how revenue is recognized that is issued by the Financial Accounting Standards Board (FASB). Outside the U.S., very similar new rules from the International Accounting Standards Board (IASB) make the change global. 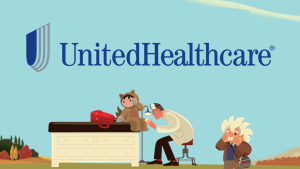 Public companies must be compliant by Jan. 1, 2018 and private companies by Jan. 1, 2019. The new revenue-recognition standard takes effect January 1, 2018. Revenue recognition principles and the rules for how you price and bundle products are about to change. Follow along as Jim Neesen of the Connor Group explains what's at stake and how you can turn the new, global accounting standards to your advantage. There’s a lot to know about ASC 606. Catch up with these e-books, webinars, and expert views. Help sales, ops, and IT work as one. ASC 606 impacts how companies go to market across the board — touching everything from packaging and pricing to deal and commission structures. The Roadmap from CPQ Data to Revenue Automation Under ASC 606. Learn about ASC 606, how it impacts your sales and revenue operations, and what you need to do to prepare your data and systems. 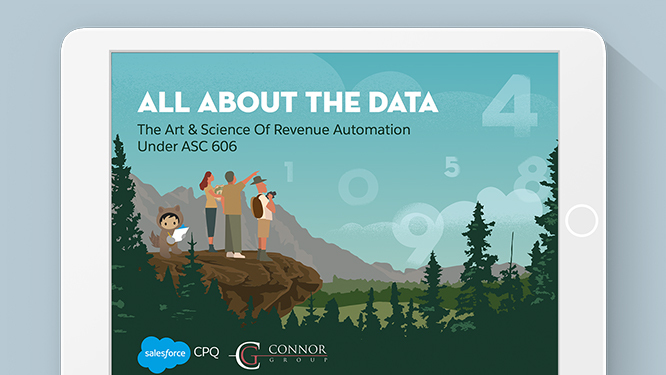 Discover the art and science of revenue automation under ASC 606. 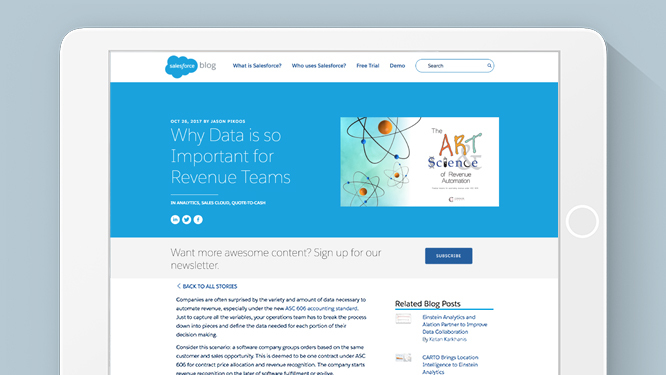 Why Data is so Important for Revenue Teams. 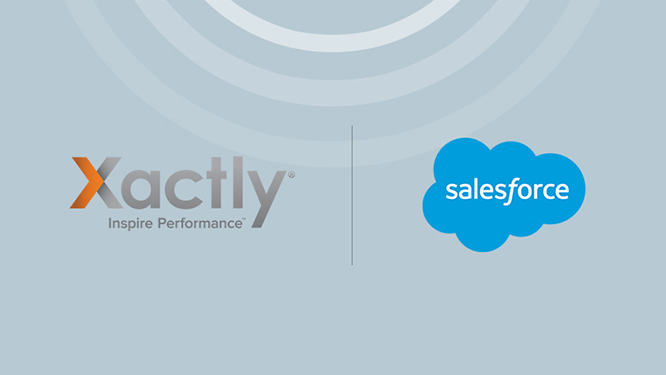 Find the best process to manage all the data you'll need to automate revenue under ASC 606. 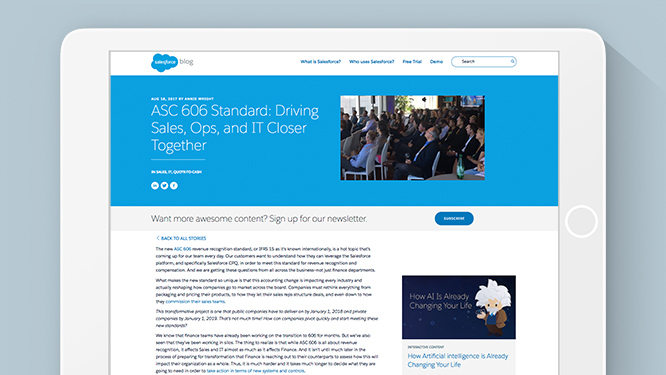 Learn how ASC 606 impacts your sales teams. Finance teams have been busy for months getting their organizations ready for the switch, but did you know that it affects sales teams too? Prepare for the new revenue-recognition standard. 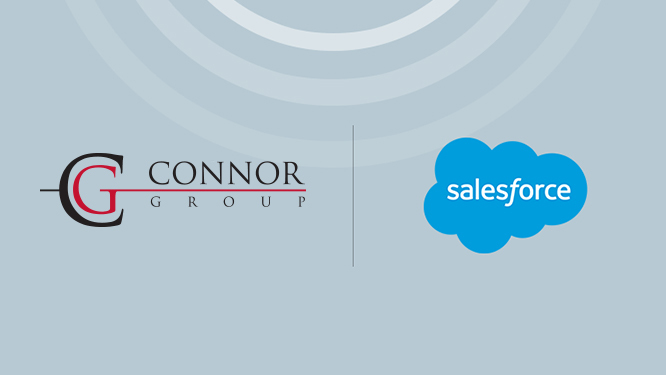 Watch a joint webinar with the Connor Group to learn more about ASC 606, how it impacts your sales and revenue operations, and if revenue-recognition software is right for you.